The nervous system has two main divisions: the central nervous system (CNS) and the peripheral nervous system (PNS) (Figure 31). The CNS is the body's control center, consisting of the brain and spinal cord. The brain is responsible for consciousness; its functions include perception, emotion, memory, thought, and language. The lower parts of the brain are also responsible for some unconscious functions, such as regulation of the endocrine (hormonal) and cardiovascular systems. The spinal cord is responsible for simple reflexes; it also serves as a pathway between the brain and the PNS. The PNS is the body's communication network; it includes the nerves and sense organs. Nerves are bundles of fibers that carry signals to and from the CNS. Motor nerves carry commands from the CNS to muscles and glands; sensory nerves carry input from sense organs (receptors) to the CNS. Different kinds of sensory receptors respond to different kinds of stimuli, which may originate either inside or outside the body. In addition to the familiar "five senses" (vision, hearing, smell, taste, and touch) there are also receptors for other stimuli such as pain, temperature, and position. The basic structural and functional unit of the nervous system is the neuron (nerve cell) (Figure 30). These cells are specialized for generating and conducting electrical impulses. A neuron has three parts: a cell body (the central part of the cell, containing the nucleus), an axon, and one or more dendrites. Dendrites and axons are thread-like projections that carry nerve impulses. Dendrites transmit impulses toward the cell body; axons transmit impulses away from the cell body. An axon may terminate on a muscle, a gland, or another neuron. The junction between the axon of one neuron and the dendrite or cell body of another neuron is called a synapse. Some axons and dendrites are sheathed in a fatty material called myelin, which acts as an insulator. Myelinated fibers can conduct nerve impulses much more rapidly and efficiently than unmyelinated fibers. In general, the somatic nerves, those responsible for skin sensation and voluntary muscle movements, are myelinated. The autonomic nerves, those responsible for visceral (internal organ) sensation and involuntary functions, are unmyelinated. Axons and dendrites that go to or from the same region of the body travel together in bundles, somewhat like telephone cables. A nerve is a bundle of axons and/or dendrites in the PNS. A bundle of axons and/or dendrites in the CNS is called a tract. 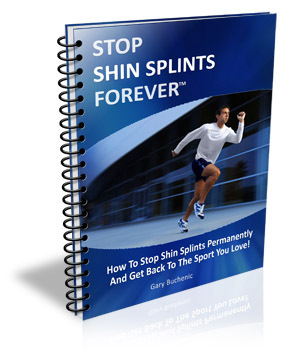 �Stop Shin Splints Forever� is a to the point downloadable e-book, jam-packed cover to cover with proven shin splint treatment methods, unique powerful techniques and the step-by-step shin splint cure I discovered in over 3 years of research. This book teach you everything you need to know to get rid of your your shin splints and those of your clients quickly, easily and permanently! Along its length, the spinal cord gives off 31 pairs of spinal nerves, which branch to form the peripheral nerves of the extremities and trunk (Figure 32). The origins of the spinal nerves, as they emerge from the cord, are called nerve roots. Each spinal nerve has two roots, dorsal (or posterior) and ventral (or anterior), which merge to form the nerve itself. The spinal nerves exit from the vertebral column through spaces between adjacent vertebrae. There are eight paired cervical nerves (C1-C8), twelve thoracic (T1-T12), five lumbar (L1-L5), five sacral (S1-S5), and one coccygeal (Co1), named and numbered according to the vertebral levels at which they exit. The spinal cord is shorter than the vertebral column, extending only as far as the L1 vertebra. Therefore, the roots of the lumbar, sacral, and coccygeal nerves descend past the tip of the cord to exit at the appropriate vertebral levels. This bundle of descending nerve roots is called the cauda equina (Latin for "horse's tail") (Figure 31). The spinal cord and brain are covered by three membranes, collectively referred to as meninges. The delicate innermost membrane, the pia, conforms closely to the surface of the spinal cord and brain. The weblike middle membrane is called the arachnoid (Greek for "spiderlike"), and the tough outer membrane is the dura. The subarachnoid space (between the arachnoid and pia) is filled with cerebrospinal fluid (CSF). The meninges thus form a fluid-filled sac around the brain and spinal cord, with sleeves for the emerging nerve roots. Gray and white matter of the brain and spinal cord: The substance of the brain consists of "gray matter" and "white matter". Gray matter is made up primarily of neuron cell bodies. White matter consists of tracts of fibers (mostly myelinated). Some of the tracts connect different parts of the brain with each other; other tracts extend down into the spinal cord. A cross-section through the spinal cord (Figure 33) reveals that it also is made up of gray and white matter. The gray matter is located in the center of the cord, in a pattern shaped somewhat like the letter H. The posterior projections of the H (the dorsal horns) contain cell bodies of sensory neurons. The anterior projections (ventral horns) contain cell bodies of motor neurons. 1. The corticospinal tracts, located in the lateral regions of the cord. These tracts carry motor commands down from the brain. 2. The dorsal columns, located in the posterior region of the cord. These tracts carry sensory input, touch, vibration, and proprioception (position sense), up to the brain. 3. The spinothalamic tracts, located in the anterior/lateral regions of the cord, carry pain and temperature sensation up to the brain. The spinal cord thus serves as a pathway for sensory and motor signals traveling between the brain and the PNS. Motor pathways have two levels of motor neurons: upper motor neurons (UMNs) and lower motor neurons (LMNs). The cell bodies of UMNs are located in the gray matter of the brain. Their long axons extend down the spinal cord (e.g., in the corticospinal tracts) to synapse with LMNs in the ventral horns. The LMNs also have long axons, which leave the ventral horns via the ventral roots of the spinal nerves. These axons travel together in bundles (motor nerves), which terminate on muscles. Thus, there is a two-neuron motor pathway (UMN-LMN) from brain to muscle. Sensory pathways are somewhat more complex, with at least three levels of neurons from the sensory receptor to the brain. Sensory receptors are actually the endings of long dendrites. The dendrites come together into bundles (sensory nerves) which ultimately enter the spinal cord via the dorsal roots of the spinal nerves. However, unlike LMNs, the cell bodies of these "lower sensory neurons" are located not in the cord, but in the dorsal roots. Each dorsal root has a swelling (the dorsal root ganglion) made up of a cluster of these cell bodies. Their short axons extend the rest of the distance along the dorsal root, and enter the dorsal horn of the spinal cord. There they synapse with "intermediate sensory neurons" in the dorsal horn. Some of these intermediate neurons have long axons which extend up the spinal cord (e.g., via the dorsal columns or spinothalamic tracts) to synapse with "upper sensory neurons" in the brain. Besides serving as a pathway between the brain and the periphery, the spinal cord is also a reflex center. A reflex is an involuntary, automatic response to a stimulus. While some dorsal horn neurons have long axons that go up to the brain (as described above), other dorsal horn neurons have short axons that synapse with LMNs in the ventral horns. Thus, some of the incoming sensory impulses reaching the spinal cord are switched immediately to outgoing motor messages, bypassing the brain. This shortcut between stimulus and response is called a reflex arc (Figure 34). Spinal reflexes are literally "brainless" responses. 2. Deep tendon reflexes. An example is the knee jerk, which is elicited by tapping on the patellar (kneecap) tendon. Incoming sensory impulses (from receptors in the tendon) are switched to outgoing motor impulses (to the quadriceps muscle). The muscle contracts, resulting in the knee jerk response. 4. Primitive reflexes. These are present in infants; but as the nervous system matures, they are suppressed or overridden by UMN output. An example of a primitive reflex is the Babinski or plantar reflex. When the sole of an infant's foot is stroked, the toes go upward and may fan out. In a normal adult, this does not happen; instead, the toes go downward. Since spinal reflexes are modulated by UMN output, damage to UMNs (either the cell bodies in the brain, or the axons in the spinal cord) causes the reflexes to be altered. For example, suppose the corticospinal tracts are severed by a spinal cord injury. UMN output is interrupted, and voluntary movement is lost; the individual is paralyzed below the level of the injury. Reflex arcs are still intact below the level of injury; but without UMN modulation the reflexes become exaggerated. This results in abnormally increased muscle tone (spasticity) and hyperactive deep tendon reflexes below the level of the injury. The picture is that of a spastic paralysis. Primitive reflexes such as the Babinski also occur, because they are no longer suppressed. Damage to LMNs (either the cell bodies in the spinal cord, or the axons in the peripheral nerves) produces a different result. For example, suppose a spinal or peripheral nerve is severed. LMN output is interrupted, and paralysis occurs in the particular muscle or muscle group supplied by that nerve. Reflex arcs involving those muscles are also interrupted, resulting in loss of tone (limpness or flaccidity). Muscles that have no tone eventually undergo atrophy (wasting). The picture is that of a flaccid paralysis. Note that there are eight cervical nerves, but only seven cervical vertebrae. The C1 nerve exits above the C1 vertebra (between C1 and the base of the skull). The C2 nerve exits below the C1 vertebra (between C1 and C2); and so on, down to the C8 nerve, which exits below the C7 vertebra (between C7 and T1). For the rest of the spinal column, each spinal nerve exits below the vertebral segment of the same name and number: the T1 nerve below the T1 vertebra; the L5 nerve below the L5 vertebra; and so on. The origins of the spinal nerves, where they emerge from the spinal cord, are called nerve roots. Each spinal nerve has two roots, one dorsal (posterior) and one ventral (anterior) (Figure 33). The dorsal root contains sensory fibers entering the dorsal horn of the cord. The ventral root contains motor fibers leaving the ventral horn of the cord. The ventral and dorsal roots merge to form the spinal nerve itself. The spinal nerves are mixed nerves (i.e., they contain both sensory and motor fibers). Plexuses and peripheral nerves: In the thoracic region, the spinal nerves (except T1) travel independently of each other, running alongside the ribs as the intercostal nerves. These give off branches that supply the trunk. In the cervical, lumbar, and sacral regions, the spinal nerves do not travel independently, but interweave with each other to form networks called plexuses (Figure 31). The lower cervical (C5-8) and first thoracic (T1) nerves form the brachial plexus, which in turn gives rise to the major nerves of the upper extremity. The lumbar and sacral nerves form the lumbosacral plexus, which gives rise to the major nerves of the lower extremity. Fibers from a given spinal nerve are distributed, via the plexus, to one or more major nerves. Conversely, each major nerve receives fibers from several spinal nerves. The major nerves of the upper extremity include the axillary (containing fibers from C5-6), musculocutaneous (C5-7), radial (C5-8, T1), median (C6-8, T1), and ulnar nerve (C8, T1). The major nerves of the lower extremity include the femoral (L2-4), obturator (L2-4), and sciatic nerve (L4-5, S1-3). Like the spinal nerves from which they are derived, these large nerves are mixed nerves, carrying both sensory and motor fibers. As the large nerves divide into smaller and smaller branches, the sensory and motor fibers eventually part company. Motor fibers separate out to form motor nerves going to individual muscles; sensory fibers separate out to form sensory nerves going to the skin and other structures. Each sensory (or mixed) nerve is responsible for supplying sensation to a certain area of skin. The sensory territories of the spinal nerves resemble long strips, and are called dermatomes (Greek for "skin slices") (Figure 35). Injury to a single spinal nerve or nerve root results in a dermatomal pattern of sensory loss. However, if the injury is located further outward along the nerve pathway, a different pattern of sensory loss occurs because the fibers are redistributed via the plexus. Similarly, each motor (or mixed) nerve is responsible for supplying a certain muscle (or group of muscles). Injury of a particular spinal nerve or nerve root results in weakness of a particular group of muscles. However, injury of a major peripheral nerve affects a different group of muscles (again, because the fibers are redistributed via the plexus). Plexus injuries result in intermediate patterns of sensory and motor loss, depending on which part of the plexus is involved.